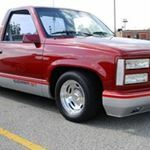 1991 GMC Sierra S T (Sports Truck) Now-27 Years Old : Modifications Have Been Made Every Year Since New: First It Was Lowered - With Heidts 2-In. Drop Pocket & Narrowed Tubular-Arms, Next 3-In. Lowering Springs, Lowering Shocks & Heavy Duty Sway Bar Up Front, Next A 6-In.Flip Kit Out Back W/ Lowering Shocks, Next Removing One Leaf On Each Rear Spring, Equaling 7-In. Drop, Next We Added 5-Ft. Long Custom Made Traction Bars (To Eliminate Wheel Hop). Next We Added American Racing 5-Star Spun Hoop Aluminum Wheels - 15 X 8 In. W/225 X 60 X 15 In. Tires Up-Front & Custom Offset 15 X 10 In. W/295 X 50 X 15 In. Out Back, Next We Made A - Custom All Steel Front Bumper W Sunken Running Lights & Sunken Lisc.Plate - Painted It To Match Body Color, Next Custom Head Lights, Front & Side Marker Lights,Tail Lights & A Third Break Light - Mounted Inside Back Window (To Give Stealth Look), Next A Rear Roll Pan - Painted To Match Body Color, Next Stainless Borla - Headers & Full Exhaust System To Tail Pipe Tips - Which Gives The Fuel Injected Motor A Unique Sound, Next Custom Aluminum Foot Pedals, Next Was A - Auto Meter 5-In. Monster Tach. W/ Shift Light Mounted On Dash (So I Can Pound TH Gears On The 5-Speed Manual Trans. W/O Over Reving), Next A Nardi ''6-Bolt'' Leather Rapped Steering Wheel & Aluminum Hub Adapter, Next A Centerforce - SFI Certified Flywheel, Dual Friction Clutch & Throw-Out Bearing, Next A Custom Altered Tailgate W/ Added Locking Handle (From A Passengers Door) For Security, Next A Hard Tanu-Cover (Painted Body Color), Now The 5.0 Fuel Injected Motor Has..."Painted"- Flame Grooved Aluminum Valve Covers & 15 In.Oval Air Cleaner ( To Keep From Polishing Them Every 3-Mo.). "This Is A Never Ending Story" The Above Mods. 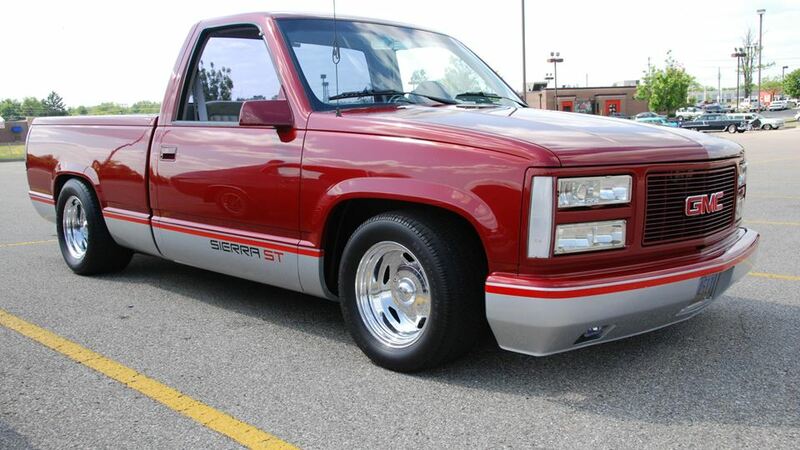 Make This Truck - A Drop Da Hammer - Gear Pounding - Corner Carving - Fun Truck Too Drive !!!! !